Spider Collection is World's Largest Spider Solitaire Games Collection with 62 Spider Solitaire Games including 11 standard spider solitaire games and 51 original games. 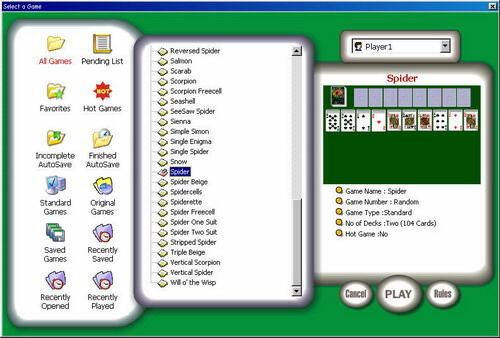 All standard spider solitaire games are included like Beetle, Double Scorpion, Scarab, Scorpion, Simple Simon,Spider, Spidercells, Spiderette, Spider One Suit, Spider Two Suit, Will o' the Wisp . ...... to it and you will not find these games in any other Solitare Game products. Qweas is providing links to Spider Collection 7.0 as a courtesy, and makes no representations regarding Spider Collection or any other applications or any information related thereto. Any questions, complaints or claims regarding this application Spider Collection 7.0 must be directed to the appropriate software vendor. You may click the publisher link of Spider Collection on the top of this page to get more details about the vendor.